Nelly is a lilac tortie darker points and white longhaired LaPerm (LPL j 03 32). She is the daughter of Jondalar and Peggy-Sue. She's an affectionate and playful cat. 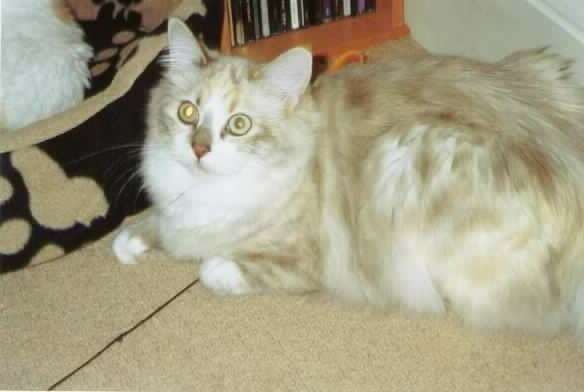 Peggy-Sue is a lilac tortie darker points and white longhaired LaPerm (LPL j 02 32) and she was bred by Carol Evans. 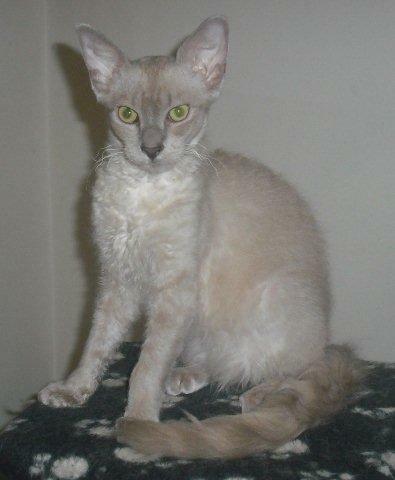 She is a sweet, gentle and affectionate cat with a very nice coat. Ruby is a tortie sorthiared LaPerm. She is a playful and affectionate girl. She is an F1 LaPerm from an outcross mating and will help to bring a new blood line to the LaPerm gene pool. Sire: Grand Champion Kagura Prince Caspian, dam: Quincunx Flibbertygibbet. Quincunx Xenobia Xoom, aka Xena, is a Lilac Longhaired LaPerm. She made her show debut at the Essex Cat Club's 2013 show and was overall Best of Variety Foreign Exhibit; a great start to a show career. Quincunx Jolene is a Lilac BCR Longhaired LaPerm, who looks just like her mother Patti. Quincunx Patricia Francurli is a lilac BCR longhaired LaPerm, whose pet name is Patti. She's named after Jean Seberg's character in A bout de souffle. She's a gentle girl and we think she's very pretty. She moved to live in Belgium in 2013. For Omaste (Champion Uluru BC Omaste Po of Quincunx) and Siouxsie (Champion Quincunx Siouxsie Banshee) see the NEUTERS page. 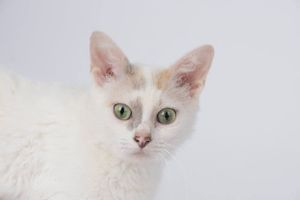 Quincunx Belette Bouclee (pet name Bel) is a lilac tortie & white shorthaired LaPerm. 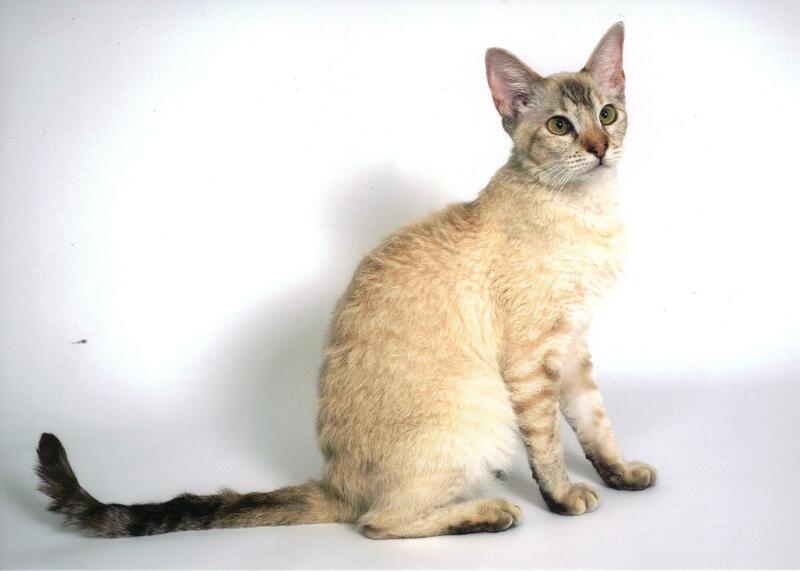 She is an F1 LaPerm and her father is a cinnamon Ocicat, which is an approved outcross for the LaPerm. This new bloodline will be beneficial to the LaPerm gene pool. She had a very nice litter of three kittens with us, including Quincunx Umberto Ecurl, who stayed with us to carry on the new blood line. She retired from breeding and now lives with Lucy and Ole. Amorcatz Lizzie Dripping, known as Bunny, is a Chocolate Tortie Darker Points Shorthaired LaPerm, who was bred by Sue Amor. We hoped to have kittens from her but she did not respond to repeated treatment for a womb infection so we thought she would be happier as a neuter and she went to live with the Head family as a much loved pet and show neuter. Amorcatz Pippi Longstocking came to us as a young adult to take over the baton from her litter sister Bunny when Bunny had to be spayed. 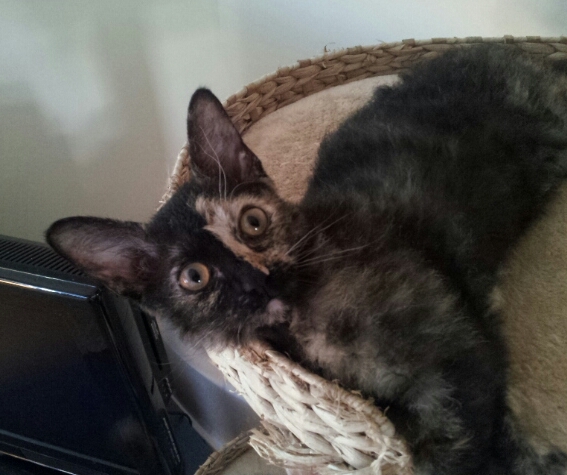 Pippi is a Chocolate Tortie Tabby Darker Points Shorthaired LaPerm. She produced a beautiful litter of kittens for us, giving us a new line. 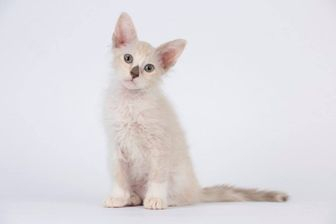 One of her kittens is Quincunx Allons-y Alonzo who you can see on the MALES page. Quincunx Lita La Lisse, known as Lita, was a LaPerm Variant (or straight-coated LaPerm) who was born here and stayed with us until she had produced a litter of kittens. 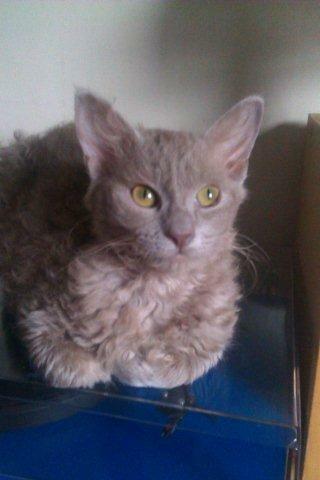 She is Blue Tortie Darker Points & White and was from an outcross mating to introduce a new LaPerm bloodline. 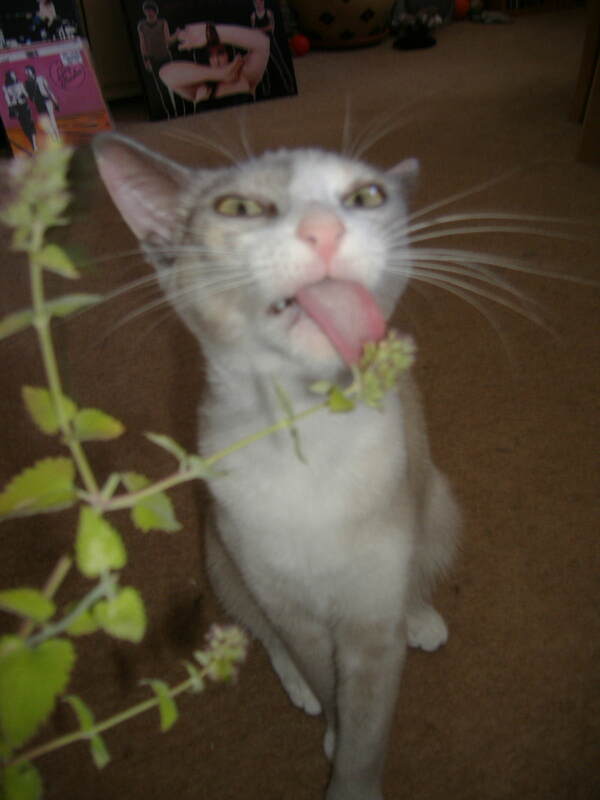 As her picture shows, she was very fond of fresh catnip! 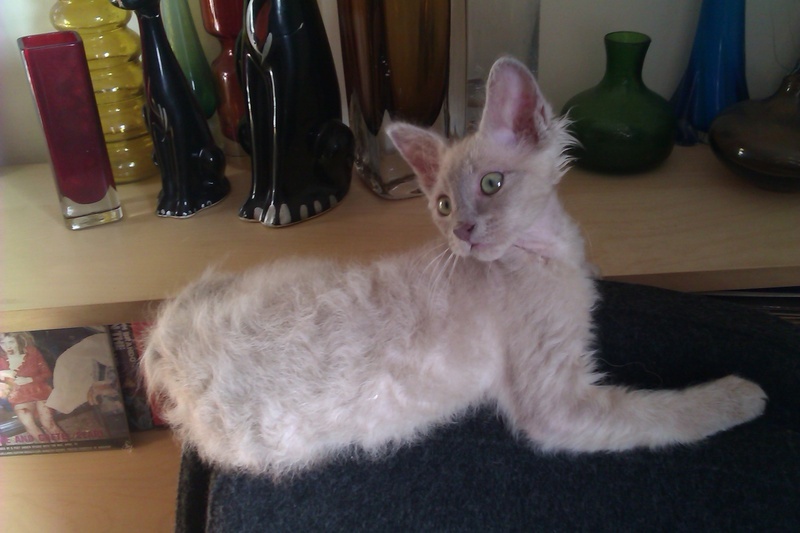 Quincunx Gridelin Greta, known as Clara, was a LaPerm Variant (or straight-coated LaPerm) who was born here and stayed until she had produced a litter of kittens. She is Blue Tortie Silver Shaded & White. Among her kittens was Quincunx Curly Coyote (see MALES page). She is one of the most sweet and gentle cats ever known.